The blossoms of the Cyclamen twist and turn like tiny butterfly wings. The silver, marbled colouring of the foliage accents the beautiful flower colours of lavender, rose, maroon, red or white. 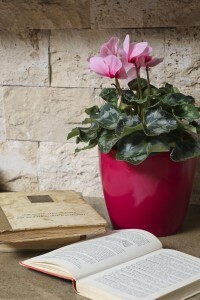 Cyclamen naturally bloom in Autumn and Winter when the weather turns cool. During the hot, dry summers, Cyclamen become dormant, their foliage yellows and dies back, and plants show no signs of growth. They store energy for the next flowering season in their round tubers. A stunning, easy-to- care for, long lasting indoor colour option that thrives in the cooler weather. 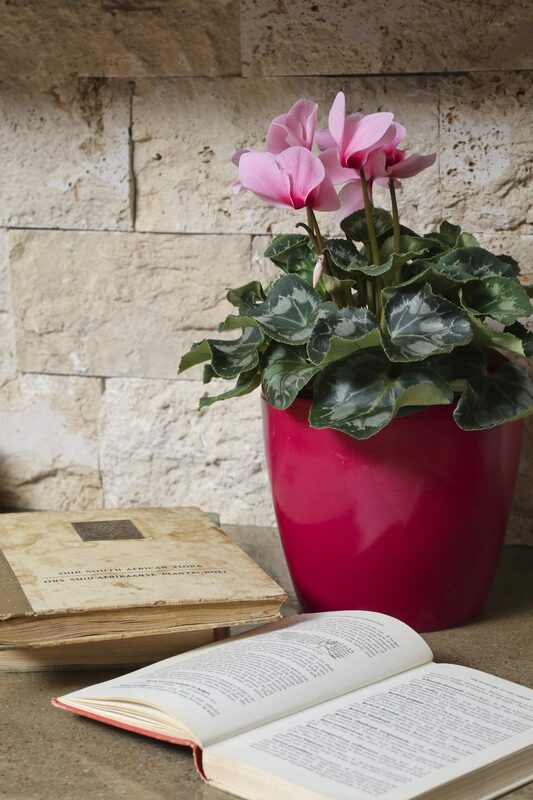 Cyclamen add colour and cheer to bedrooms, living areas, entrances and most indoor rooms – they are also excellent pot specimens on patio’s and in sheltered areas of the garden. ● Temperature: Cyclamens do not like heat. Do not expose them to temperatures below 4°C or higher than 25°C. 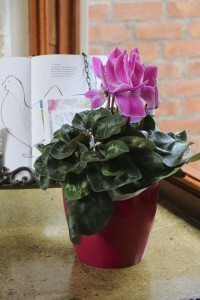 ● Light: Give the cyclamen bright, indirect light in the winter. While your plant is dormant during the summer, keep it out of bright light. ● Soil: Cyclamens are very tolerant of diverse soil types and are not concerned too much with the pH, although they prefer a slightly alkaline soil. ● Watering: Cyclamens are a bit fussy about watering – they must be watered from the bottom. Don’t water the leaves, but rather keep the pot in a shallow bath of water so that the plant can soak up what is needed.